Murrayfield Racers face a tough weekend double-header as they continue their pursuit of silverware this season. 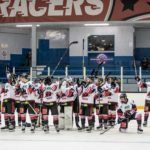 The Racers visit Paisley Pirates in the SNL on Saturday, before hosting Kirkcaldy Kestrels in the first leg of their Scottish Cup semi-final tie the following day. 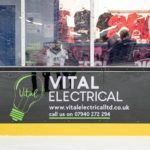 The Edinburgh-based club head into the fixtures on the back of an impressive 4-1 victory over Sheffield Steeldogs in the NIHL North Cup last Sunday. 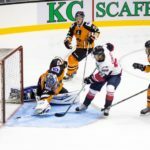 The reigning D1 champions had won five in a row during 2019, but a Michael Ireland hat-trick and an inspired performance by goalie Mark McGill saw the Racers emphatically end that run. Forward Aaron Robertson says hard work was the key to the victory. “Last weekend was a great experience for everyone,” he said. “We all had specific roles to play that night to try and give us the best chance of winning against a side playing at a higher level. Saturday’s trip to Braehead Arena pitches the Racers against one of their main rivals for the league title this season. The two sides are level on 15 points, just two adrift of Dundee Comets and Kirkcaldy at the top of the standings. However, with games in hand on the other trio Robertson believes the Racers are in a great position heading into a crucial part of the campaign. “We know hard this is going to be – if we get the right results in the next few weeks, the league can practically be decided there and then,” he added. Murrayfield turn their attentions to the Scottish Cup on Sunday as they go head-to-head with the Kestrels. 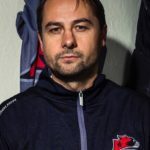 The Racers won both Stuart Robertson Cup encounters and recorded a draw in their solitary league meeting with Kirkcaldy and Robertson expects a close battle this weekend. “The Kestrels are another hard-working team with really good depth,” he said. “They are very capable of rolling three or four lines all night long against us, so we’re going to have to be raring to go with a good squad ourselves. Please click here for details about the Paisley game and here to purchase tickets for Sunday’s match (the cup tie is not included on season tickets).